F. Sherwood Rowland, the world's untiring defender of a trace upper-atmosphere gas he made a household word, died Saturday March 10,2012b at his home in Corona del Mar, California, of complications from Parkinson's disease. Frank Sherwood Rowland (born June 28, 1927) is an American Nobel laureate and a professor of chemistry at the University of California, Irvine. His research is in atmospheric chemistry and chemical kinetics. Born in Delaware, Ohio, Rowland received his B.A. from Ohio Wesleyan University in 1948. He then earned his M.S. in 1951 and his Ph.D. in 1952, both from the University of Chicago. He held academic posts at Princeton University (1952-56) and at the University of Kansas (1956-64) before becoming a professor of chemistry at the University of California, Irvine, in 1964. At Irvine in the early 1970s he began working with Mario Molina. Rowland was elected to the National Academy of Sciences in 1978, and served as a president of American Association for the Advancement of Science (AAAS) in 1993. 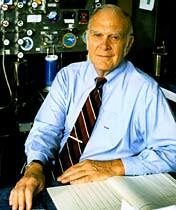 His best-known work is the discovery that chlorofluorocarbons contribute to ozone depletion. 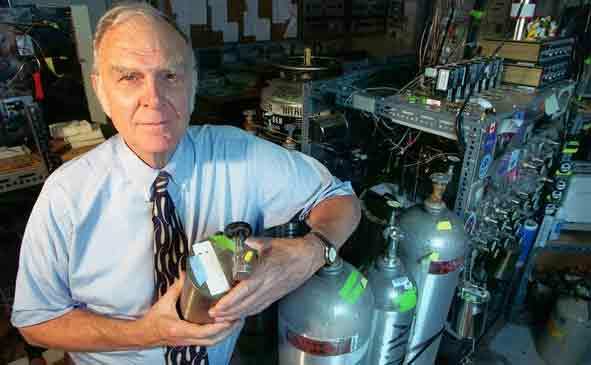 Rowland theorized that manmade organic compound gases combine with solar radiation and decompose in the stratosphere, releasing atoms of chlorine and chlorine monoxide that are individually able to destroy large numbers of ozone molecules. Rowland's research, first published in Nature magazine in 1974, initiated a scientific investigation of the problem. The National Academy of Sciences concurred with their findings in 1976, and in 1978 CFC-based aerosols were banned in the United States. He received the 1995 Nobel Prize in Chemistry along with Mario Molina of MIT and Paul Crutzen of the Max Planck Institute for Chemistry in Mainz, Germany. The Physical Sciences Building at the University of California, Irvine, which held his laboratories for many years, was renamed Rowland Hall in his honor that same year. I was born on June 28, 1927, the second of three sons, in the small central Ohio town of Delaware, the home of Ohio Wesleyan University. My father and mother had moved there the previous year when he took the position of Professor of Mathematics and Chairman of the Department at Ohio Wesleyan. All of my elementary and high school education was received in the Delaware public schools from an excellent set of teachers. The Delaware school system then believed in accelerated promotion, so that I entered first grade at age 5 and skipped the fourth grade entirely, with the result that I entered high school at 12 and graduated a few weeks before my sixteenth birthday. The college preparatory curriculum was strong on Latin, English, History, Science and Mathematics. The academic side of high school was easy for me, and I enjoyed it. In several summers of my early teens, the high school science teacher entrusted to me during his two week vacations the operation of the local volunteer weather station, an auxiliary part of the U.S. weather service-maximum and minimum temperatures and total precipitation. This was my first exposure to systematic experimentation and data collection. Our home was filled with books, and all of us were avid readers. My reading at that time ran toward naval history, which was complemented with realistic scale-models and simulated naval battles using an elaborate mathematical system for rating each warship and the effects of combat on them. During my sophomore year in high school, my math teacher, who also coached tennis and basketball, encouraged me to take up tennis - which led me onto the varsity tennis team for my junior and senior years, and into a full decade of intense athletic competition. As a senior, I played on the varsity basketball team. After graduation from high school in 1943, almost all of my male classmates immediately entered the military services. However, because I was still well under the compulsory draft age of 18, I enrolled at Ohio Wesleyan and attended the university year-round for the next two years. During these war years, only 30 or 40 civilian males were on campus, plus about 200 naval officer trainees and 1,000 women. With so few men available, I played on the University basketball and baseball teams, and wrote much of the sports page for the University newspaper. My accelerated academic schedule made me eligible for my final year of university in June, 1945, as I approached my 18th birthday. However, with the fighting in the Pacific and the continuing military draft, I enlisted in a Navy program to train radar operators. The Pacific war ended while I was still in basic training near Chicago, and I served the next year in several midwestern Naval Separation Centers, as the 10,000,000 Americans who had preceded me into the military were returned to civilian life. A major amount of this Navy time was devoted to competitive athletics for the Navy base teams, and I emerged after 14 months as a non commissioned officer with a rating of Specialist (Athletics) 3rd class. My first real opportunity to see the rest of the United States came when I was transferred to San Pedro, California for discharge from the Navy. I then hitchhiked 2000 miles back to Ohio, traveling through Yosemite and Yellowstone Park on the way. This year away from the academic life convinced me that at age 19, there was little reason for me to seek a quick finish to my undergraduate education. I therefore arranged my schedule to take two more years rather than one to graduate, and continued to play basketball on the university team. My coursework at Ohio Wesleyan emphasized science within a liberal arts curriculum, with more or less equal amounts of chemistry, physics and mathematics, and majors in all three fields. As had been the case in high school, I really enjoyed the academic side of university life. I do not honestly remember when the decision that I would go to graduate school was made. My father had studied for his Ph.D., and all of us took it for granted that I would, too. Furthermore, both my parents had firm convictions that the University of Chicago, which each had attended, was not just the best choice for graduate work, but the only choice. So I applied to the Department of Chemistry at the University of Chicago for Fall 1948, and was duly admitted. All service veterans were entitled to a certain number of months (27 in my case) of paid university education, and I had not used any of these credits during my undergraduate years at Ohio Wesleyan because faculty children did not pay tuition, and I lived at home. I therefore didn't apply for any of the teaching assistantships or academic fellowships, and was quite surprised after arriving in Chicago to find that many of my fellow students were being paid by the University to attend graduate school. In subsequent years, I was supported by an Atomic Energy Commission (A.E.C.) national fellowship. At that time, the Chemistry Department of the University of Chicago had a policy of immediately assigning each new graduate student to a temporary faculty adviser prior to the choice of an individual research topic. My randomly assigned mentor was Willard F. Libby, who had just finished developing the Carbon-14 Dating technique for which he received the 1960 Nobel Prize. Bill Libby (although I never called him anything but "Professor Libby" until I was more than 40 years old) was a charismatic, brusque (on first meeting, "I see you made all A's in undergraduate school. We're here to find out if you are any damn good!") dynamo, with a very wide range of fertile ideas for scientific research. I settled automatically and happily into his research group, and became a radiochemist working on the chemistry of radioactive atoms. Almost everything I learned about how to be a research scientist came from listening to and observing Bill Libby. The first nuclear reactor had been built by Enrico Fermi in 1942 under the football stands at the University of Chicago, and the post-war university had managed to capture many of the leading scientists from the Manhattan Project into the Physics and Chemistry departments. My impression at the time (and now in retrospect 45 years later) was that this was an unbelievably exciting time in the physical sciences at the University of Chicago. My physical chemistry course was taught by Harold Urey for two quarters and in the third quarter by Edward Teller; inorganic chemistry was given by Henry Taube; radiochemistry by Libby. I also attended courses on Nuclear Physics given by Maria Goeppert Mayer and by Fermi. (The chemistry student grapevine said, "Go to any lecture that Fermi gives on any subject"). Urey and Fermi already had been awarded Nobel Prizes, and Libby, Mayer and Taube were to receive theirs in the future. My thesis concerned the chemical state of cyclotron-produced radioactive bromine atoms. The nuclear process not only creates a radioactive atom, but breaks it loose from all of its chemical bonds. These highly energetic atoms exist only in very, very low concentration, but can subsequently be traced by their eventual radioactive decay. Bill Libby gave his graduate students an unusual amount of leeway in how they chose to use their time, and was a superb research superviser - supporting, encouraging, but never letting one forget that intensive critical thought, together with unrelenting hard work on experiments, underlay all progress in our research. My interest in competitive athletics also continued unabated in graduate school. Because of the atypical structure of its undergraduate college system, the University of Chicago, unlike almost all other American universities, permitted graduate students to compete in intercollegiate athletics. During my first graduate year, I played both basketball and baseball for the University teams. I continued to play baseball for the University during the spring for two more years, and spent both of those summers playing semi-professional baseball for a Canadian team in Oshawa, Ontario. Each winter I also played for several basketball teams around the city of Chicago. Without a doubt, however, the major extracurricular event of those four years at the University of Chicago was meeting and then marrying on June 7, 1952, Joan Lundberg, also a graduate of the University. We have now shared more than 43 years of married life - and shared is really the descriptive word. I finished my Ph. D. thesis in August of 1952, and we went off to Princeton University in September of that year for my new position of Instructor in the Chemistry Department. Our daughter Ingrid was born in Princeton in the summer of 1953, and our son Jeffrey in Huntington, Long Island, in the summer of 1955. In each of the years from 1953-55, I spent the summer in the Chemistry Department of the Brookhaven National Laboratory. An early experiment there of putting a powdered mixture of the sugar glucose and lithium carbonate into the neutron flux of the Brookhaven nuclear reactor resulted in a one-step synthesis of radioactive tritium-labeled glucose, an article in Science, and a new sub-field of tritium "hot atom" chemistry. The A.E.C. also expressed considerable interest in this tracer chemistry, and offered support for continuation of the research. In 1956, I moved to an Assistant Professorship at the University of Kansas, which had just completed a new chemistry building including special facilities for radiochemistry. Contract support from the A.E.C. was already approved, and in place when I arrived that summer. Several excellent graduate students interested in radiochemistry joined my research group that summer, and were shortly joined by others and by a series of postdoctoral research associates, including many from Europe and Japan. This research group was very productive for the next eight years, chiefly investigating the chemical reactions of energetic tritium atoms and I moved through the ranks to a full Professorship. Both Ingrid and Jeff grew up knowing the members of the group - meeting everyone at our regular home seminars, and from an early age occasionally visiting the laboratory. During these Kansas years, too, the everyday routine was that the entire family came home for lunch. Later on in California, Ingrid and Jeff each worked regularly (but unpaid) drafting slide and journal illustrations for the chemistry department, and thereby continuing to know the members of my research group. The Irvine campus of the University of California was scheduled to open for students in September, 1965, and I went there in August, 1964, as Professor of Chemistry and the first Chairman of the Chemistry Department. The A.E.C. support turned out to be truly long-term, surviving this transfer, and then the transformations of the A.E.C. into the Energy Research and Development Administration and then into the Department of Energy. That basic contract finally terminated in 1994, by which time NASA was furnishing the major support for our continuing research. When I decided in 1970 to retire from the Chemistry department chairmanship, I once again sought some new avenue of chemistry for our investigation. Because the state of the environment had become a significant topic for discussion both by the general public and within our family, I traveled to Salzburg, Austria, for an International Atomic Energy Agency meeting on the environmental applications of radioactivity. Afterward on the train to Vienna, I shared a compartment with an A.E.C. program officer also coming from the IAEA meeting. He learned in our conversation that I was personally interested in atmospheric science because of my early association and admiration for the 14C work of Bill Libby, and further that my research had then been supported by the A.E.C. for the previous 14 years. I in turn learned that one of his A.E.C. responsibilities was the organization of a series of Chemistry-Meteorology Workshops, with the intention of encouraging more cross-fertilization between these two scientific fields. In due course, I was invited to the second of these workshops in January, 1972, in Fort Lauderdale, Florida, where I heard a presentation about recent measurements by the English scientist, Jim Lovelock, of the atmospheric concentrations of a trace species, the man-made chlorofluorocarbon CCl3F, on the cruise of the Shackleton to Antarctica. His shipboard observations showed its presence in both the northern and southern hemispheres, although in quite low concentration. One of the special advantages cited for this molecule was that it would be an excellent tracer for air mass movements because its chemical inertness would prevent its early removal from the atmosphere. As a chemical kineticist and photochemist, I knew that such a molecule could not remain inert in the atmosphere forever, if only because solar photochemistry at high altitudes would break it down. However, many other possible chemical fates could be imagined, and I wondered whether any of these might occur. In early 1973, my regular yearly proposal was submitted to the A.E.C. and was duly approved and funded by them. In addition to the continuation of several radiochemistry experiments, I also included in the proposal a new direction - asking the question: what would eventually happen to the chlorofluorocarbon compounds in the atmosphere? Later that year, Mario Molina, who had just completed his Ph. D. work as a laser chemist at the University of California Berkeley, joined my research group as a postdoctoral research associate. Offered his choice among several areas for our collaborative research, Mario chose the one furthest from his previous experience and from my own experience as well, and we began studying the atmospheric fate of the chlorofluorocarbon molecules. Within three months, Mario and I realized that this was not just a scientific question, challenging and interesting to us, but a potentially grave environmental problem involving substantial depletion of the stratospheric ozone layer. A major part of both of our careers since has been spent on the continuing threads of this original problem. Since 1973, the work of my research group has progressively involved more atmospheric chemistry and less radiochemistry until now our only important use of radioisotopes is directed toward problems associated with atmospheric chemistry. This research work has been conducted at the University of California Irvine by a strong, hard-working group of postdoctoral and graduate student research associates, together with some able technical specialists. The chlorofluorocarbon-ozone problem became a highly visible public concern in late 1974, and brought with it many new scientific experiments, and also legislative hearings, extensive media coverage, and a much heavier travel schedule for me. This change came after both Ingrid and Jeff had moved away from home for their own university educations, leaving Joan free to accompany me in these travels. She has attended-and sat through with perceptive interest - countless scientific meetings since 1975. She quickly became quite conversant with the general scientific aspects of ozone depletion, and has been a knowledgeable and trusted confidante through all of the last two decades of ozone research. Ingrid and Jeff, too, have maintained close contact and support during those often controversial years. In many ways, the understanding of atmospheric chemistry is still in an early stage. The necessary instrumental precision and sensitivity for dealing with chemical species in such low concentrations has only been progressively available over the last two decades, and of course the trace composition of the atmosphere is highly variable around the world. The research group has been heavily involved in a series of regional and global experiments, often since 1988 as participants in comprehensive aircraft-based atmospheric field research. Some of this research involves challenging and interesting scientific puzzles, and some can also be described as directed toward global environmental problems. As with the ozone depletion capability of the chlorofluorocarbons, one does not always know until well into the work whether it belongs to the second category as well as the first. We continue to find fascination in the chemistry of the atmosphere.